Chinese Tea smoked chicken is not new, celeb chefs over here in UK have been doing it for years. This smoked chicken I am doing here is how Chinese would normally do it. To ensure the chicken is full of flavour I marinated (brined) it for almost 36 hours. The chicken is steamed then followed by smoking. No oven roasting is necessary. As you can see the chicken is beautifully golden brown and rich in smoke flavour. The marinade/brine also penetrates the meat which gives it a lovely flavour at the same time keeping the chicken very juicy. This smoking method can either use whole chicken or chicken portions. 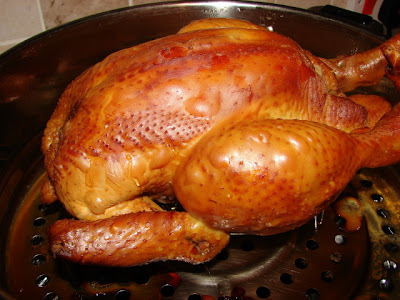 For this recipe I am using a whole chicken around 1.75kg. Put the chicken in a zip lock bag, add marinade. Seal the bag. I used double bags just in case there is any leakage. Keep chicken in the fridge. Turning twice a day. 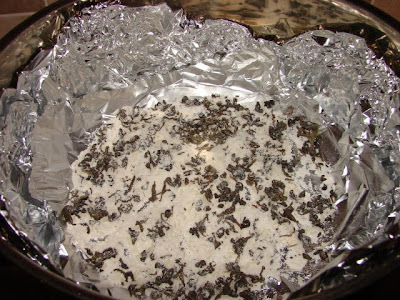 Before cooking take it out 30 - 40 minutes earlier to bring it to room temp. Take the chicken out and remove every bits of spices. Ready for steaming. For the left over marinade, I boiled and strained it. Use it for noodle soups or add to any stir fries. I used a dish to collect any cooking juice then rest then chicken on a rack so the juice will not touch the chicken. The steamed meat juice has a lovely flavour, can be used as sauce or stock. Steaming time depends on the weight of the chicken, the chicken is not ready to eat after steaming, it will continue to cook while smoking. If you just like to steam and serve the chicken without smoking add another 10 - 12 minutes steaming time. 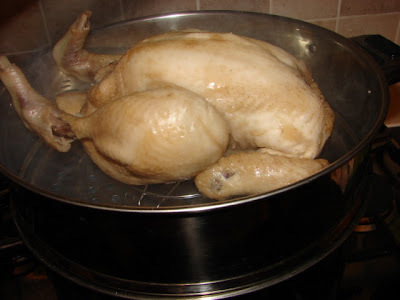 To steam the chicken, when water is boiling turn the heat to medium. Very high heat steaming the meat outside will cook rapidly and turn tough before the inside is cooked. When the chicken is done take it out and straight onto the smoker soon as you can. 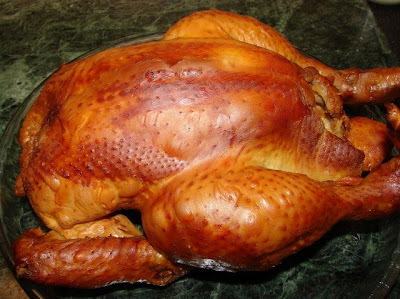 For whole chicken make sure to drain the juice from the carcass inside, ready for smoking immediately. 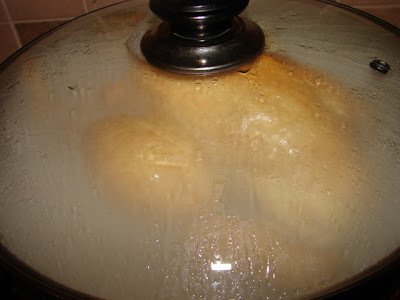 Use a wok/large old pan/steel stove top steamer, all with a lid. I used the same steel steamer that steamed the chicken for the smoking. Double or triple lined the dried 'smoker' with large pieces of foil. Put a rack on top of the smoking material, or in my case I used a steel steamer I put the rack on the steamer. Put Chicken on the rack and put the lid on. Turn the heat up to medium and soon you will see white smoke, then turn the heat down to low. I could really smell the flavour coming out of the tea. Smoke the chicken till golden brown. 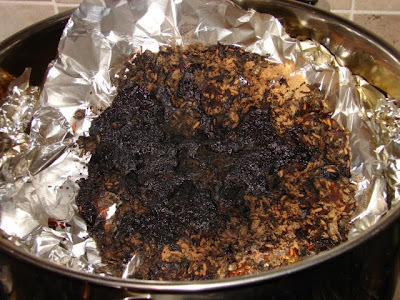 Do make sure you take care of the smoke alarm while smoking and turn the cooker hood fan on. There shouldn't be too much heavy smoke lingering your kitchen that you may need the fire extinguisher anytime. Do not leave the kitchen unattended while smoking. Here is a picture when the chicken has just put on the 'smoker' while the smoking material beginning to puff up white smoke. If you have a glass lid for the 'smoker' you will soon see the chicken will turn yellowish after 5 minutes the colour will get deeper and deeper. This is when the chicken started to brown. As you can see there is still heat and some steam to continue cooking the chicken while smoking. This is when done after about 20 minutes. Heat off and let the smoke settles for few minutes before taking the chicken out. As you can see there is not a lot of juice dripped on the steamer. The chicken has turned very deep golden brown. Leave the chicken to cool and rest before chopping the Chinese style or carving. Here is the charred material left. It has turned black and very hard. Just chuck it job done. The cleaning part of my steel steamer after smoking was very easy, just a little cream cleanser it's sparkling again. Looks delicious. Will try this soon. Thanks for sharing your recipe. Thank you Ube and Gill. It much easier to make and less messy than you think. Wow - that looks fantastic! I would love to do it but I don`t think I`ll be up to scratch to master these techniques.